Lightweight, flexible, and puncture-resistant, PunctureX™ composite structures can stand up against the most demanding applications. They are engineered for durability, product integrity, and ease of production. 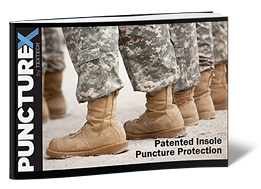 For your reference, we have provided a downloadable copy of our PunctureX Insole Puncture Protection Data Sheet, which you can access by filling out the form on this page.